Gattu is a rare Children’s Film Society of India (CFSI) film to get a multiplex release. 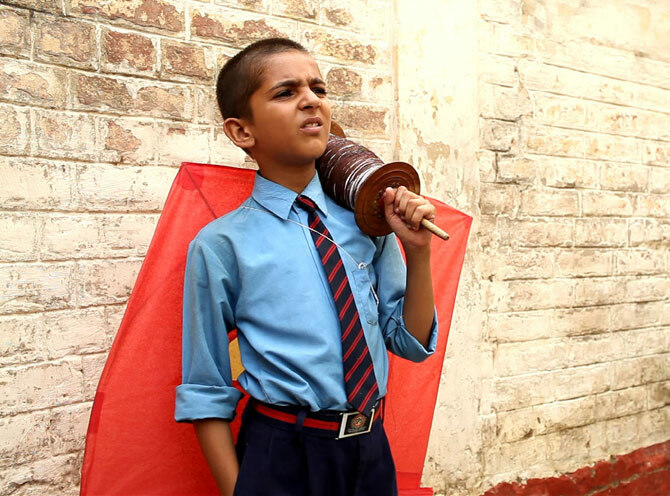 Rajan Khosa’s sweet little film has made the festival rounds and won afew accolades. It is an atypical CFSI film, in that it’s not simplistic, preachy or visibly low-budget. It more or less follows the template set by Iranian films, that use children to tell stories about their society. The idea of an underprivileged child’saspirations has been put forth in I Am Kalam, and the kite motif utilised in Yeh Khula Aasman, but Gattu is charming because itsstreet-smart protagonist is a fast-thinking wonder brat. An orphan (Mohammad Samad) lives and works in the unbearably grungy surroundings of his uncle Anees Bhai’s (Naresh Kumar) junk yard in the depressing-looking town of Rourkee. The uncle is strict, if not cruel, but the impact of the harshness of child labour is seen in the ravaged face of Gattu’s co-worker. Gattu and the other young vagabonds around, fly kites as a means of escape (the impact of Bollywood or TV seems conspicuousby its absence) and all of them aspire to defeat the mysterious black kite, named Kali by the awed kids, that spares none in keenly fought aerial battles. A higher spot is needed to challenge the supremacy of Kali, and when Gattu learns that the tallest building in the town is the school he steals, lies and sneaks into class (in a plot contrivance,the school is hosting some exchange students, so Gattu’s sudden presence is not noticed) under the nose of the sermonising principal (Jayant Das). To reach the coveted terrace, he cooks up an absurd plot, recruits other kids and reaches the final battle with Kali, that will make him the champ. For one who has hardly any exposure tothe outside world through books, TV or movies, Gattu’s mind is a remarkable cauldron of outrageous scenarios, and the director seems to admire his underhand means to achieve his goals—not exactly the right sort of message to pass to kids, whose moral compass must already be a bit off in today’s unscrupulous times. Because the actor looks so cute and has such yearning in his eyes, Gattu’s borderline criminal behaviour passes through. You feel sorry for the other street kids who are left in the junk heap because they didn’t have scheming brains. (The tantrum Gattu throws when accused of stealing is a marvel of acting, particularly when he is guilty). Still, it’s always interesting to see how people live in parts of drab Indian towns that progress seems to have bypassed. The locations are suitably bleak (and why should multiplex kids be spared the sights? ), the actors all utterly natural. The film may entertain kids (if they can be dragged to see a CFSI film), but is likely to discomfit grownups, which could just be what the director intended.